Constructed in 1930 and designed by Albert Kahn, the Service building was developed solely for the use and enjoyment of the employees. The building was essentially two buildings in one with a grand auditorium occupying the west half of the building. Offices, classrooms, dining and recreational areas and health services spaces occupied the floors on the east half of the structure. The original brick on the outside of the building shows the recognizable Heinz name in white, adding to the curb appeal of the property. Original Terrazzo flooring can be found throughout as well. An atrium running vertically through the center of the structure showcases original industrial beam work. Vacant since 2008, MCM, is transforming the Service Building into 151 market-rate apartments. While maintaining the historic features of the building, the renovation provides energy efficient, cutting-edge design feautres including 58 micro-units to the existing Heinz complex. The building is being restored in accordance with the Secretary of the Interior Standards for Rehabilitation making it eligible to receive Federal Historic Tax Credits. The project will also be seeking National Green Building Standards (NGBS) certification. Heinz at 950 North Shore is set to open in the historic building in January 2017, right near the river with easy access to walking trails, Heinz Field and PNC Park. The community sits minutes from the historic Strip District, housing boutiques, restaurants and entertainment nearby. Amore has begun accepting lease applications for the rental property at this time. Spacious one and two bedroom units are available and the building offers a fitness center, community room and courtyard with grilling and games area for residents. For more information call (412) 533-0139 or visit www.950northshore.com. 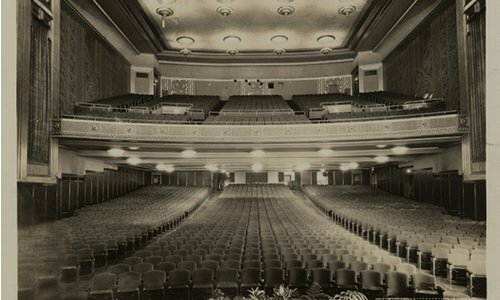 The Heinz Company Auditorium, dedicated in 1930, was built by H.J. Heinz for the use, comfort, and happiness of the employees of his corporation. 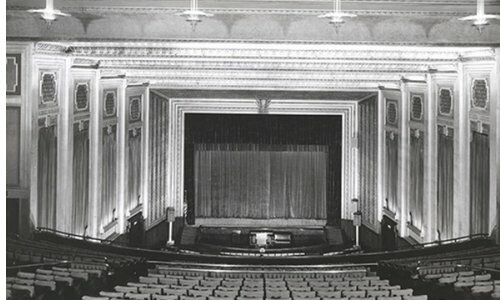 Designed for a wide variety of educational and recreational uses, the auditorium had all the conveniences of a modern theater and concert hall including a complete pipe organ and seating for 3,000. Some of the auditoriums many decorations include soft-toned fabrics which paneled the walls, flame-colored upholstering, and large murals in both the theater and the lobby. Connected to this auditorium were a number of reception rooms, lecture rooms, and dining halls specifically for the enjoyment of Heinz employees. Dedicated in 1930, the Heinz Auditorium was built for use by the employees of the Heinz Corporation. The auditorium has all the conveniences of a modern theater and concert hall including the full pipe organ and seating for 3,000. This photo of the entrance to the auditorium is representative of the artistice time and effort spent on the entire structure. The following description was found in the company brochure advertising the features of the new structure:"The auditorium foyer typifies in its design the spirit of restrained modernism which has imbued the planning of the building." 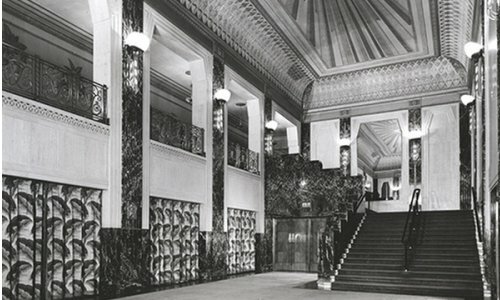 Like the auditorium and various other lecture and reception rooms, the lobby of the structure was decorated with soft-tone fabrics and large murals.